Now that the warmer weather is here, it’s time to get outside and enjoy it to the fullest extent. 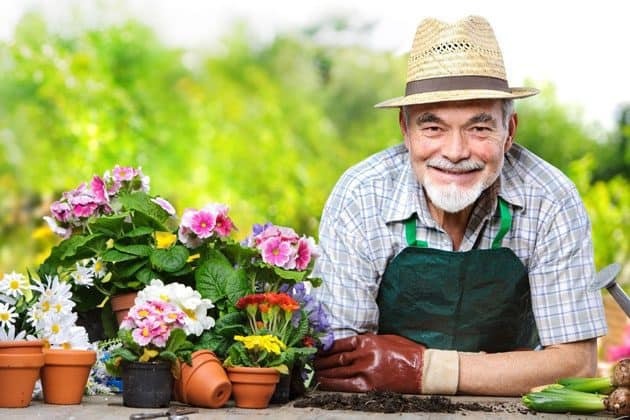 With new life blossoming everywhere these days, a favorite activity for many older adults is getting your hands dirty in a garden this summer, planting all your favorite flowers, vegetables, spices and more. It’s great exercise. Gardening utilizes movements like bending, lifting, kneeling and digging, which engages several different muscle groups and encourages the use of fine motor skills. Did you know you can can actually burn up to 300 calories in one gardening session? It’s true! It keeps you healthy and can help prevent some diseases. Getting your hands dirty occasionally is a good thing! There’s a “friendly” bacteria in soil called mycobacterium that is known to alleviate symptoms of allergies, asthma, and even depression. Plus, the physical aspect of gardening helps keep your bones and joints healthy and strong, which can prevent conditions like osteoporosis. It gives your mood a boost. Have you ever noticed how much better you feel after spending a day in the sunshine? This is because the sun’s rays provide both vitamin D and serotonin levels, the “feel-good” hormone in your brain. Gardening also promotes relaxation and reduces stress, which are key to decreasing your risk for depression. It’s fun to do with friends. Gardening can also be a fun social experience, especially if you’re part of a gardening club. Or, consider joining others with green thumbs for a day of planting, weeding, trimming, harvesting or cutting flowers. It’s a rewarding experience. There’s no denying that nurturing another living thing creates a sense of accomplishment. Tending to your garden each day, watching your flowers and plants thrive because of the gentle care you provide offers a true sense of purpose to your day. Before you get out there and start reaping all the benefits of gardening, keep a few safety tips in mind. For example, always wear sunscreen or protective clothing, and avoid the hottest time of the day, which is typically 3 p.m. Pace yourself, work in 20- to 30-minute increments and change your position frequently to keep your muscles from getting stiff. If necessary, use lightweight, ergonomic tools that are longer and have more cushioning to make tasks easier. Most importantly, don’t forget to stay hydrated if you’re out there on those hot summer days! Gardening is undoubtedly one of the most beloved activities at Silver Maples Retirement Neighborhood. In fact, if you enjoy getting your hands in the soil or delight in sharing your gardening knowledge, we offer several opportunities for you to cultivate these passions. Our Memorial Garden is a beautiful place for family to memorialize loved ones with engraved bricks, benches and trees. This tranquil space has evolved over the years with the help of our Memorial Garden Committee, which is made up of seasoned and passionate gardeners including a master gardener – all whom call Silver Maples home. Weekly, during gardening season, you’ll find our committee out beautifying this gorgeous space which provides a seasonal change of color and textures. Check out a few recent pictures of our committee working in the garden on our Facebook page! Additionally, our newly created Cutting Garden features raised beds; residents and family members are encouraged to cut fresh flower arrangements and create their own unique bouquet to enhance their private homes. Creating and supporting a positive aging experience is a top priority at Silver Maples. We look to enrich the lifestyles of our residents by providing plenty of opportunities for each person to continue to enjoy all of their favorite activities – even gardening. If you’re interested in learning more about our vibrant senior living community near Ann Arbor, we invite you to come see Silver Maples for yourself and check out the various senior living options we offer. If you’re still researching your options and aren’t quite ready to visit, we encourage you to get to know us from afar by viewing our videos and reading some of the personal stories and testimonials shared by residents, their families and our staff. Or, feel free to connect with us through social media to get a peek at daily life at Silver Maples. You can even request more information to receive our brochure packet. We’re eager to discuss options when you’re ready, so contact us when you would like to chat and learn more.